The Gentleman Crafter: Getting Dylusional Tonight: Ustream! Good Terrific Tuesday Morning Everybody! Just popping in to make sure you come and pop over to my Take Out Tuesday Ustream Show Tonight! Try saying that fast three times!!! LOL! Going to play in my Dylusions Art Journal TONIGHT! Trying to get some practice in before I join my pals for Dyan Reaveley's classes this weekend at The Crafty Scrapper in Waxahachie, Texas! Yahooooo! Can't wait to be with my friends and enjoy the AMAZING talents of Lady Dy...For a FULL WEEKEND! Nothing gets better than that! Yep, pulling out ALL the Dylusions Sprays, Stamps and Stencils tonight to come up with a Dylusional Page! Who know what will happen! LOL! I never do until it's done! 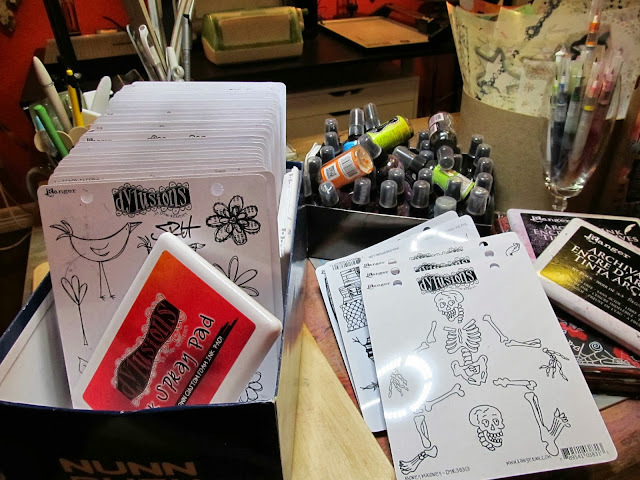 So, come get Funkadelic with the fun bright colors and stamps of Dyan Reaveley's Dylusions! Can you believe October is finally here...start making your lists! I have bunches of them ....they are everywhere!!! Yahoo! I'll be there. Looking forward to seeing what you come up with. see you this weekend!!! woo-hoo! GOODIE!!! I was just thinking about pulling out my Dy journal and practicing, too! Great minds....and all that stuff...LOL! See ya tonight. Love Dylusions' Takeout nights! I have to take my good old lab to the vet, but I hope to catch the tail end. Almost a pun, right? I would love to take Dy's class. I guess I'll need to come down to Texas. Please give her an extra hug for me; I can tell she's going through a rough patch. ENJOY yourself! I've never heard of these before. There are so many items out on the market. I'm going to have to look these up and I'll be sure to watch the stream to see how to use them. Thanks so much for sharing.